The ball mill is the key equipment for crushing the material after it has been crushed. It is widely used in the production of cement, silicate products, new building materials, refractory materials, fertilizers, black and non-ferrous metal dressings and glass ceramics, dry or wet grinding of various ores and other grindable materials. The ball mill is suitable for grinding various ores and other materials. The ball mill is composed of a main part such as a feeding part, a discharging part, a turning part, a transmission part (2 stage cylindrical transmission gearbox, a small transmission gear, synchronous motor, and an electric control). The hollow shaft is made of cast steel, the inner lining can be replaced, the rotary large gear is processed by casting hobbing, and the barrel is embedded with wear-resistant lining, which has good wear resistance. The machine runs smoothly and works reliably. 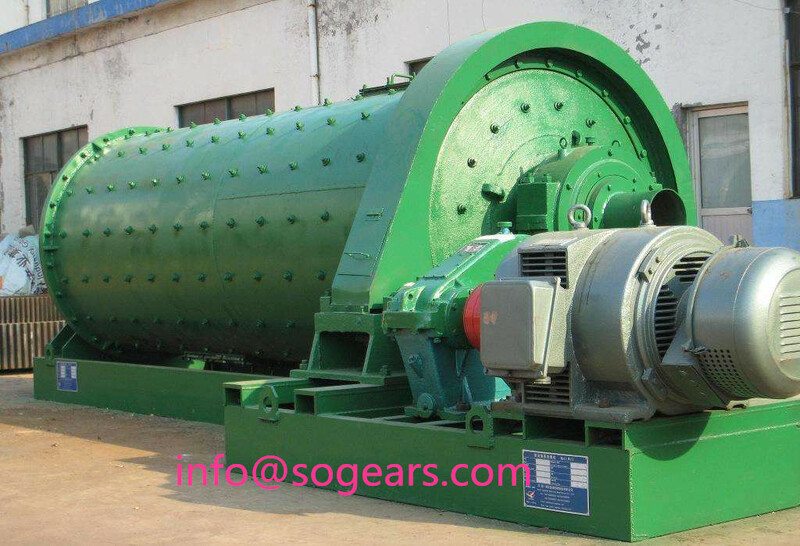 The main body of the ball mill comprises a cylinder body with a lining made of wear-resistant material, a bearing for carrying the cylinder and maintaining its rotation, and a driving part such as 3 phase motor, and a ZQ50-40.17-II Speed Reduction Gearbox, a pulley, a V-belt and the like. The transmission ratios of such ZQ circular tooth reduction gearbox are: 48.57, 40.17, 31.5, 23.34, 20.49, 15.75, 12.64, 10.35, 8.23. In addition, ball mill accessories include large gears, small gears, hollow shafts, ring gears, large ring gears, steel balls, compartment plates, transmissions, bearings, end linings, etc. Regarding the part called the blade, it is generally not the main part. In the feed inlet of the component at the feeding end, there is an inner spiral which can be called an inner spiral blade, and an inner spiral in the discharge opening of the component at the discharge end can also be called an inner spiral blade. In addition, if a screw conveyor is used in the auxiliary equipment at the discharge end, there will be a part called a spiral blade in the equipment, but strictly speaking, it is not a part of the ball mill. 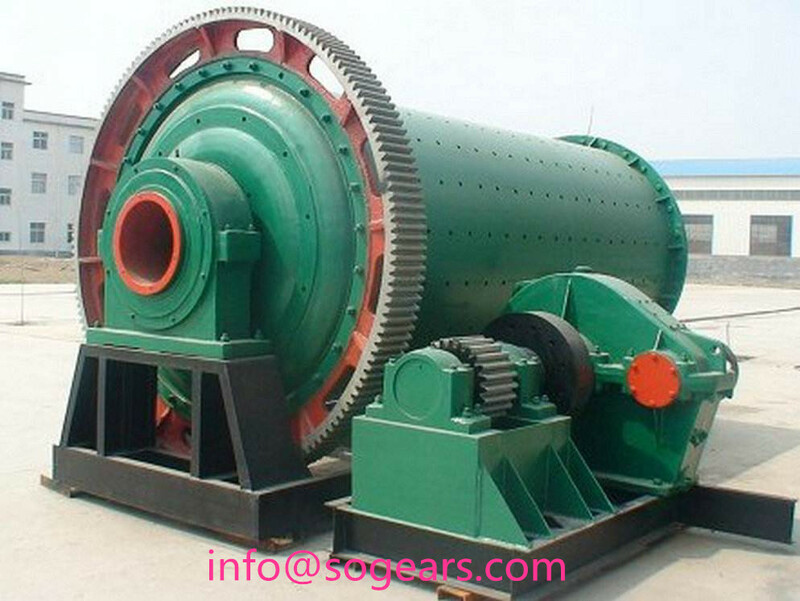 The structure of the ball mill large gear has various shapes due to different use requirements, but the gear can be regarded as a ring gear and a wheel body from the technical point of view. According to the distribution pattern of the teeth on the ring gear, it can be divided into straight teeth, helical teeth, herringbone teeth and the like. 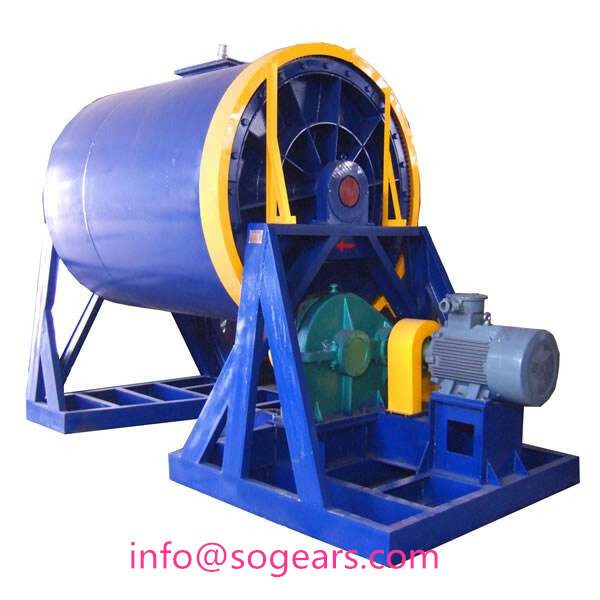 Dry ball mills and wet grid ball mills are available depending on the material and the method of discharge. The energy-saving ball mill adopts self-aligning double-row centripetal spherical roller bearing, which has small running resistance and remarkable energy saving effect. In the cylinder part, a section of conical cylinder is added at the discharge end of the original cylinder, which not only increases the effective volume of the mill, but also makes the medium distribution in the cylinder more reasonable. This product is widely used in the grinding of non-ferrous metals, ferrous metals, non-metal beneficiation fields and chemical and building materials industries.